Would you mind providing the sources for your amazing nutrition data? 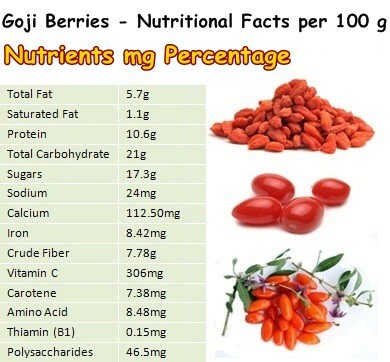 I would like to promote Goji berries among my nutrition coaching clients, but I can’t seem to find credible sources or reliable data on these amazing power berries. Most of the nutritional tables you will see on the website are from the National Nutrient Database for Standard Reference provided by the United States Department of Agriculture (USDA) which, in my opinion, is the most accurate and credible source available. Unfortunately, they do not yet possess nutrition data on goji berries which is why I have gathered the nutritional information on goji from an old Italian biology textbook. Sadly, I am not able to provide the exact name and authors of the textbook due to the fact that I am no longer in possession of it. Kind regards.